Message from the LDV Prez Gina Rome Regarding the Upcoming 2016 Season! I am Gina Rome, the President of LDV. Recently, while in the UK, I practiced with the Cambridge Rollerbillies and I got to cross “play international roller derby” off my derby bucket list. Our Vice President, Chelsea Fristoe (aka Bang) is an OG Vixen, having been with the league since the days of skating on a theater stage. Treasurer Irish Justice is no stranger to the E-Board, as she has been our financial guru for a few years now, and our Secretary Maleficent Midge is as speedy on the track as she is taking notes and assembling votes. 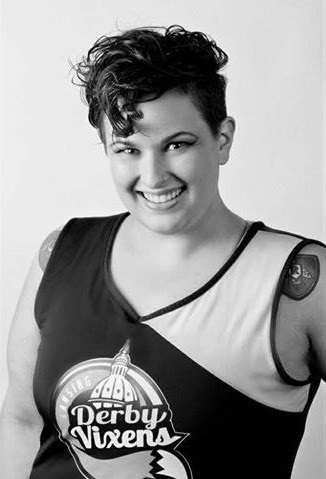 Finally, our Skater at Large, Ace of Spanxx is not only a derbyist in her own right, but her daughter On Death Rose has just played her first game with the Lansing Junior Vixens! After a well-deserved off season of eating, lounging around, and being merry, the Lansing Derby Vixens have begun slowly getting back into the swing of derby. All those sugar cookies don’t seem like such a good idea now, do they? Luckily, Coach Magic Hanz has been easing us back into endurance and agility, and also teaching us how relieve sore muscles and prevent injury. Thanks Hanz! While the Lansing Derby Vixens are in the midst of tryouts and pre-season conditioning, the Lansing Junior Vixens have already played (and won!) their first game. We are excited that a handful of LJV skaters will be “aging up” this season, so look for them on adult rosters later in the year. Also joining the ranks of the Lansing Derby Vixens is our latest graduating Fresh Meat class. They’ve passed their tests, chosen their names, and are ready to hit the ground rolling. The Vixens teams will be traveling more than ever in 2016, with games all over the state of Michigan—including WFTDA-recognized tournament Roll Kill taking place in Kalamazoo—as well as places like Ithaca, NY, and beyond! But never fear, you’ll still be able to marvel at the lightning-fast jammers and punishing blocks LDV and LJV here in Lansing at Aim High and the Summit. Make sure to check lansingderbyvixens.com for all the latest information. And, we’ll be hosting the WFTDA D2 Tournament in August, 2016! Finally, it’s the most wonderful time of the year… Skatie Hawkins! Skatie is LDV’s biggest and most boisterous fundraiser, but I like to think of it as being like Mardi Gras, New Year’s Eve, prom, and the Oscars rolled into one. Skatie Hawkins will take place onSaturday, March 5 at Spiral Dance Bar in Old Town Lansing, and the theme is the totally tubular 80s. We can’t wait for you to join us for the silent auction, league awards, and utter shenanigans as we dance the night away and celebrate Lansing roller derby. To fans, skaters, officials, coaches, derby lovers of all ages, and readers: your time, energy, and love are what make this league great. Thank you for the supporting strong, athletic, revolutionary Lansing Derby Vixens! Thank you for such a lovely introduction and informative, energizing message! I was excited for this season already – but now I’m totally psyched!